This Vegetable and Shrimp Sauce is perfect for Boiled White Yam, Rice, Potatoes, Plantain and other boilable staple food. And very easy to prepare. You will also need the staple food that you will serve with the Vegetable and Shrinp Sauce. I will be using yam (white puna yam). If you do not have sweet peppers (paprika), use tatashe. But remember that while sweet peppers are not spicy hot, tatashe is very spicy hot. You can also use red bell peppers which are not spicy hot. If you do not have ugu, use spinach. You can also use green amaranth if you do not mind the taste. Peel the shrimps if they are not already peeled. Dice the onions, the sweet peppers (deseeded) and the habanero peppers. Start preparing the staple that you will serve it with. I am using yam so i cut and peel the yam, rinse, put in a pot and add water to cover it. On another burner, set the frying pan or pot and pour the vegetable oil. When hot, add some of the diced onions. Add the shrinps and sautee for 7 minutes, stirring it all the time. When slightly brown, remobe the shrimps from the frying pan and set aside. Add the remaining onions into the oil in the frying pan and fry for about 3 minutes or till slightly brown. Add the diced peppers and fry for 5 minutes. Crush and add the stock cubes, salt and the black pepper. Stir and add the sliced ugu and stir very well. Add the fried shrimps, stor and it is done! 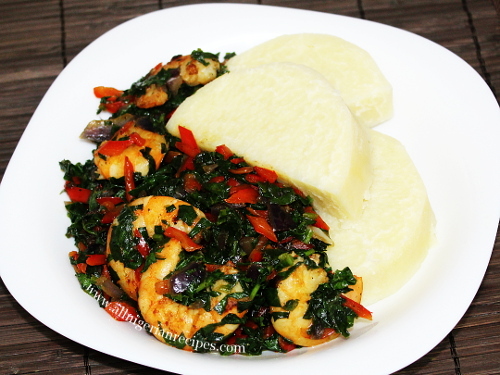 Serve with the boiled white yam. Yum!